10 a.m. | Adventure Center Opens | This is the place to meet for your Laurel Ridgeline Zipline Tour, purchase your All-Day Adventure Pass, Downhill Mountain Biking Rentals, Segway Tours and so much more! 4:30 - 9 p.m. | Seafood Buffet | Enjoy the delicious selection of fresh seafood, made to order pastas, fresh vegetables, breads, salads, desserts and more at the Seafood Buffet in the Slopeside. 8-12 p.m. | Bavarian Lounge | Sit back, grab a drink and listen to live music. 9 p.m. - 1 a.m. | Matterhorn Lounge | Dance the night away with our DJ! ★ 9 a.m. | Kids' Mud on the Mountain | Kids, it's your turn to take on Mud on the Mountain and play in the mud without getting in trouble with your parents! CLICK HERE for details and registration. 10 a.m. - 3 p.m. | Near the Adventure Center | Our DJ kicks off the start of summer fun and adventure at the Adventure Center by playing your favorite tunes as you climb the Rock Wall and flip on the EuroBungy! 11 a.m. - 9 p.m. | Bavarian Beach | Relax poolside and grab a bite to eat and drink from the Beach Bar & Grille. 12-4 p.m. | Bavarian Beach | Take a dip or lounge poolside and listen to live music. ★ 1-4 p.m. | Carnival | Located near the Ski Lodge, come play games and enjoy some great carnival treats! 4:30 - 9 p.m. | Farmers' Buffet | Featuring a bountiful selection of locally-sourced vegetables and proteins from our Laurel Highlands neighbors including Sana View Farm, Sunny Slope Farm, Summer Smile Honey Farm and more! ★ 7-9:30 p.m. | Country Legends Tribute Concert | Country Legends tribute concert features three incredible tribute performers playing the biggest hits from Shania Twain, Garth Brooks and The Zac Brown Band in a high-powered performance you’ll never forget! For tickets and event information, please CLICK HERE. 8 p.m.-12 a.m. | Bavarian Lounge | Sit back, grab a drink and listen to the live music. 9 p.m. - 1 a.m. | Matterhorn Lounge | Dance the night away as our DJ keeps the party going at Seven Springs. ★ After Country Legends | Fireworks | Zambelli Fireworks light up the mountain. Great views from the festival grounds! ★ 8-10 a.m. | Breakfast with Princesses & Super Heroes | The best way to start the day is with a delicious breakfast. Your favorite super heroes and princesses will be stopping by the Slopeside making sure all the kids are ready for another fun filled day on the mountain. 11:30 a.m. - 2 p.m. | Sunday Brunch | Enjoy the delicious selection of breakfast favorites, carved round of beef, seafood, bakery fresh breads, desserts and more at our Sunday Brunch! ★ 4:30-9 p.m. | BBQ Buffet | The BBQ Buffet is located in the Slopeside. Enjoy a variety of fresh salads, BBQ chicken, sliders, roasted vegetables, pastas and more! ★ 6-9 p.m. | Spinning Jenny | Join us on the Festival Grounds for this free concert, open to all-ages. ★ 9-11 a.m. | Kids' Fishing Derby | Kids ages 12 and under an encouraged to participate in this free fishing derby. Prizes will be awarded for the biggest and smallest fish, the most fish caught and skunked. Space is limited, please call 814-352-7777, ext. 7899 for more information or to make a reservation. ★ 1-4 p.m. | Bavarian Beach Pool Party | Party at the Beach with our DJ, fun inflatables and more! This fantastic show, on Saturday, May 25, features the music of some of the biggest names and most loved artists on the American country music scene, with tributes to The Zac Brown Band, Garth Brooks and Shania Twain, brought to life by amazing look-a-like, sound-a-like touring tribute performers. The concert features two 60 minute sets, with the tribute artists backed by a band of stellar musicians that bring a wealth of experience and expansive careers in music to the stage. Each artist will perform a string of hits from the legendary superstars, complete with authentic costumes. To add the finishing touches, all the artists will return to the stage for a grand finale performance together! 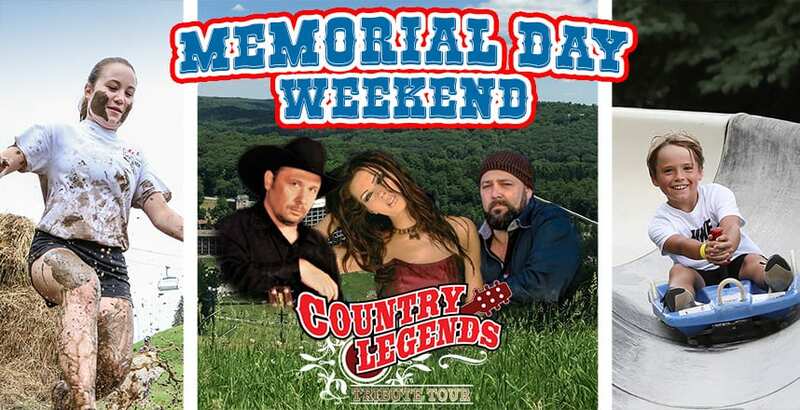 Country Legends Tribute Concert Saturday, May 25 at 7 p.m.
Price does not include applicable taxes and fees. Tickets are only available through ShowClix and may be purchased online or over the phone at 1-888-718-4253 (Monday-Friday, 9 a.m.-9 p.m. EST). Seven Springs Mountain Resort celebrates the unofficial start of summer with festive activities, live music, Zambelli Fireworks and plenty of family fun all weekend long! If you want to stay late and start early, take advantage of our special Memorial Day package! Starting at $203 per person based on double occupancy. Hotel rates are per person, based on double occupancy. The all-day adventure pass does not include any add-ons for ziplines, paintball or biking. Hours for activities may change without prior notice. Please refer to the Mountain Courier or the Adventure Report for the most up to date hours. Blackout dates may apply. Advanced reservations are required. Package cannot be combined with any additional discounts, coupons offer or contracted rate. Restrictions apply.